Barry Bonds is back and that means one thing - HOME RUNS! 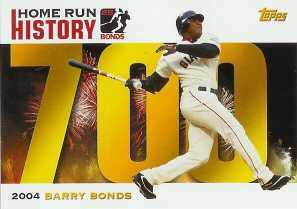 2005 Topps Baseball Series 2 featured one of the hottest insert sets of the year -- Barry Bonds Homerun Highlights! And this ultimate Bonds collection continues in the upcoming Topps Updates & Highlights. In the all-new Updates & Highlights (previously named Topps Series 3), Topps chronicles Barry's blasts # 331 - 660. Cards are inserted 1:4 packs with each featuring specifics of that particular home run on the card's back. Topps Updates & Highlights releases the week of 11/14 and carries a $1.59 SRP for each 10-card pack. The Home Run History set will be caught up to date with the release of 2006 Topps Series 1, which will feature home run cards 660-7?? And for Home Run History insert collectors, there is "The Barry Bonds Trading Floor", a special website dedicated exclusively to collectors who wish to trade cards from this special set. Log onto www.topps.com to learn more.